No, the tailored perks you get from your credit card doesn't mean the bank is psychic. They mean it's tracking when and where you spend your money. NEW YORK ( TheStreet) -- If you ever get the feeling that someone's watching when you grab a Hershey bar at the drugstore checkout, or succumb to the allure of that Hermes handbag, you're not wrong. Credit card issuers such as American Express (AXP - Get Report) , Citigroup (C - Get Report) , and Synchrony Financial (SYF - Get Report) , are increasingly relying on big data to analyze and predict client shopping patterns. For cardholders, that means specially tailored perks to entice more swiping; for the card issuers, it means higher profits from increased sales at retail partners and larger interest charges on your monthly statement. It's not a business any bank can afford to take lightly: U.S. residents made $2.53 trillion in purchases through Visa (V - Get Report) , Mastercard (MA - Get Report) , American Express, and Discover (DFS - Get Report) last year, according to The Nilson Report, which tracks the card and mobile payment industries. "The goal of a credit card company is to get you to spend as much as possible on your credit card," said Nick Clements, a former managing director for Barclay's who now runs MagnifyMoney, a company that helps consumers decipher the fine print of financial products. That's become trickier since the financial crisis, as some customers have grown more cautious about discretionary spending. Which is where so-called Big Data comes in. While swiping a credit card seems familiar to the point of banality, it actually reveals a massive amount of information: time of day, location, store visited, transaction size. When that's compounded with other swipes from the same client, patterns emerge. Credit card companies can learn when clients pick up Starbucks on their way to work, get groceries, and go clothes-shopping. The data is becoming so precise that when speaking of the bank's Chasenet payment processing platform during a conference in May, JPMorgan Chase (JPM - Get Report) CEO Jamie Dimon said: "We know where you eat on Friday night." While credit card issuers may not use the same cautionary terminology as MagnifyMoney -- or Jamie Dimon for that matter -- they don't hide how they're using client data. For instance, Citi Retail Services, the Citigroup unit that provides more than 90 million private label and co-branded cards to merchants such Macy's (M, Sears (SHLD, Shell (RDS.A, and The Home Depot (HD, "uses its proprietary analysis tools and customer behavior database to drive sales and market share for our retail partners and more relevant offers to our customers," a spokeswoman wrote in an emailed statement. The use of big data has led to a 13% retail sales lift for Citi's partners, the spokeswoman said. Though card issuers are reluctant to reveal the secret sauce behind their algorithms for proprietary reasons, it's clear that they employ similar tactics: using past behavior to predict and even influence future behavior. American Express's, for instance, assesses customers' "spending preferences and the offers they've redeemed in the recent past to generate recommendations," a spokeswoman said in an e-mail. "Based on this data, a group of offers are then prioritized for each individual and they keep evolving as the algorithm learns and improves." With more than 112 million cards in circulation and over $34.5 billion in revenue, Amex' algorithm has a lot of transactional data to pull from. In addition to directly receiving perks, cardholders can also access offers by following the brand on social media, which generates even more information. Data points and algorithms are increasingly taking precedence over focus groups in marketing departments. Synchrony Financial, which was recently spun off from General Electric (GE - Get Report) and issues credit cards for retailers, has launched a data-driven service called Next Best Offer. It "analyzes data about a consumer's shopping habits and delivers personalized discount and loyalty offers via mobile devices," said Sanjay Sidhwani, a vice president of marketing analytics tasked with creating Synchrony's data strategy. 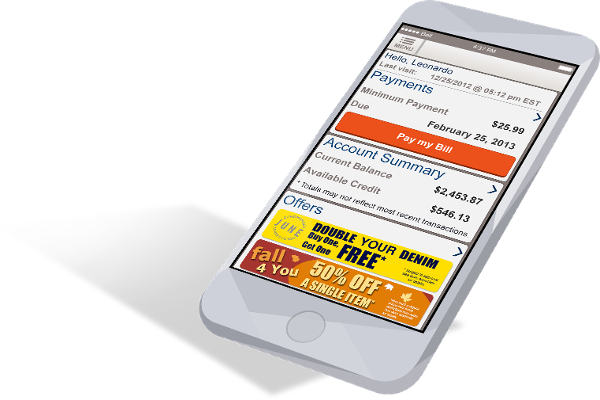 The loyalty offers appear on a client's phone as pictured below in a mock-up image provide by Synchrony. For clients who regularly pay their balance monthly, the deals offered by card issuers can lead to freebies or savings on purchases they were already considering. However, the credit card industry refers to these clients as "gamers," for gaming the system, according to Clements. Card issuers want to court their most profitable customers: the ones who maintain a high balance and diligently pay only the minimum. "The ideal customer for a credit card company slowly builds a balance," said Clements. "In my experience, it usually takes 18-24 months. Most people don't make one big purchase and regret it. Instead, they tend to spend a bit more than they should every month. And an extra $200 a month can turn into nearly $5,000 in 2 years." Offering perks to cardholders to boost purchases, while enhanced by Big Data, isn't a new practice. Before e-statements became the norm, people were accustomed to seeing paper advertisements, such as scratch-and-sniff cologne samples, in printed statements delivered to their mailboxes.